Posted on October 30, 2013 October 16, 2016 , in Moffett Truck Mounted Forklift. There are many different factors that have to be taken into account when determining what type of maintenance has to be conducted on Moffett truck mounted forklifts. No matter what industry this equipment is being used in, it demands a daily pre-shift inspection. This is the fastest way of warding off any potentially serious problems and ensuring that all of the safety features are in prime operating condition. The inspection should focus on the wear and tear of the various equipment parts and ensure there are no missing components. Adjustments should be made as necessary and the operator should be informed of any unusual sounds or noises. These daily inspections, plus keeping the forklift clean, go a long way in keeping the Moffett in prime condition. Aside from the amount of use that the equipment is getting, the conditions in which it is operating in will play an important role in its performance, while helping to dictate what maintenance requirements there are. 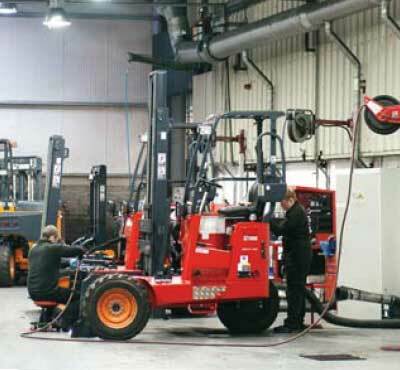 The more attachments that are fitted to the forklift will also increase the maintenance needs. One area that can become easily neglected is lubricating the moving parts. A physical inspection of the bearings and rollers, as well as the chains and bushes, will immediately indicate the need for greasing the appropriate parts. If this is not kept up with on a routine basis, eventually the forklift is going to be in need of major repairs. The operator must remember to check for and remove any debris that tends to cling to the machine, as leaving it could cause oil to leak from the chains and bearings. Not only does the lubrication keep the moving parts operating smoothly, but it also helps to protect these parts from moisture that will eventually lead to corrosion. Moffett truck mounted forklifts are often used in areas where the temperatures are at sub-zero or perform their work in high humidity areas where sea air may be present. Being diligent with the daily inspections are most important in these circumstances. For clear direction as to what will keep the Moffett forklifts fully optimized, referring to the operators manual that comes with each machine is recommended. Not only does this manual give the right guidelines for maintenance, but it is full of other handy information, such as safety measures, driving techniques, and even truck mounting procedures. If you’d like to learn more about performing regular maintenance on Moffett forklifts to minimize repairs, check out this article in HIAB Method Magazine. If you have any questions at all, please don’t hesitate to leave a comment below or call us. We are here to help.